Mom bought our train tickets through the travel agent when she planned our trip. We’re on our way to Assisi. I hinted at this story in that post, and now (better late than never) seems the perfect time to tell this tale. 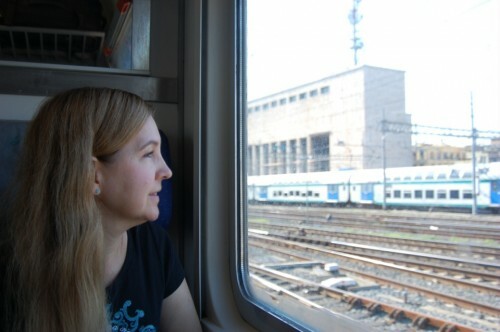 When we arrived at the train station in the morning, we knew two things: we needed to board the train to Fiumicino (if I recall correctly) and change trains at the stop in Foligno (if I recall correctly), and that mom had bought us first class tickets. 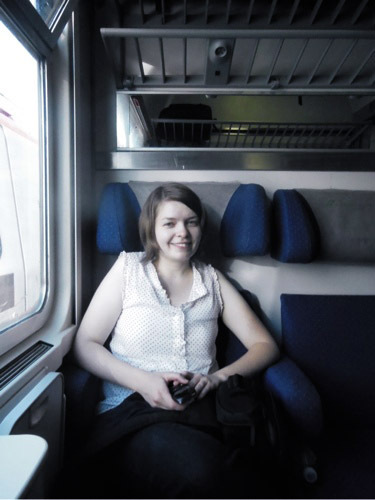 We found our train, walked into the first car (which we assumed must be the first class coach), found an empty compartment and settled in to the two seats next to the window. “It’s kind of like taking the Hogwarts Express!” I said. An older Italian man was the next to enter the compartment. He could tell just looking at us that we’re American, and he spoke just enough English to ask us where we were going and what we were doing in Italy. We told him we were off to Assisi for a week. He chuckled. Another woman came in to the compartment next. She took her seat across from the Italian man, next to the door. Two more people walked in and filled the remaining empty seats. We didn’t have any snacks or water, so mom gave me a few Euro coins and sent me off in search of water. Those were exactly the things that one of the train employees was saying to mom when I walked back in to the compartment. Here’s what happened after I left: two more women came into the compartment and one of them said to mom (in Italian) “you’re in my seat.” The Italian man tried to help translate, but the woman was causing a scene, and so one of the train employee guys came in to sort things out. The two went back and forth in Italian for a minute or two, and then the Italian man asked mom “where did you buy it?” Mom told him, he talked animatedly with the train employee guy for another minute and then said “oh, you’re going to Assisi! You’re on the wrong train.” Mom (or maybe it was me, I don’t remember) explained that we’d looked it up online and would change trains in Foligno. So, a bit frazzled, mom and I unloaded our suitcases and moved to the third car. The first car was packed. The second car was packed. The third car … was nearly empty. We claimed a compartment to ourselves, and a few minutes later, the train pulled out of the station and we breathed a collective sigh of relief. We would make it to Assisi! After taking my seat in the empty compartment. There was one more (brief) moment when we thought they’d turn the train around and kick us off – after the first stop, the same train employee guy walked into our compartment, asked to see our tickets again, and said in very broken English that there was a difference in the price and we’d have to pay fifty Euro. Mom handed him a credit card. 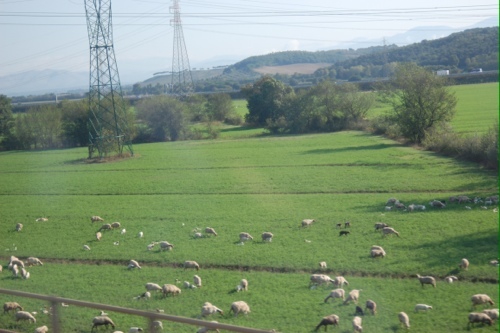 The view of the Italian countryside from the train.